Is anyone else as confused as I am by the weather? One day it's 20 degrees and everything looks frozen, then the next it's raining and feels more like spring. That's how the weather was here in Boston yesterday, warm with downpours. Although we're expecting snow tomorrow, I wouldn't be surprised if we see a lot more rain this winter, so today I'm sharing four essentials for looking stylish, while remaining dry, in the rain. The Trench Coat: A trench coat is a true classic, and in my opinion, an item every woman should have in their wardrobe. I've owned the one I'm wearing for several years now, and know that I will have it for many more to come. A great fitting trench can make any outfit look polished while adding a level of sophistication. I also love the fact that they can be worn year round. Although I wouldn't wear one in freezing temps unless I have many layers on, they are perfect for the very confused weather we've been experiencing this winter. 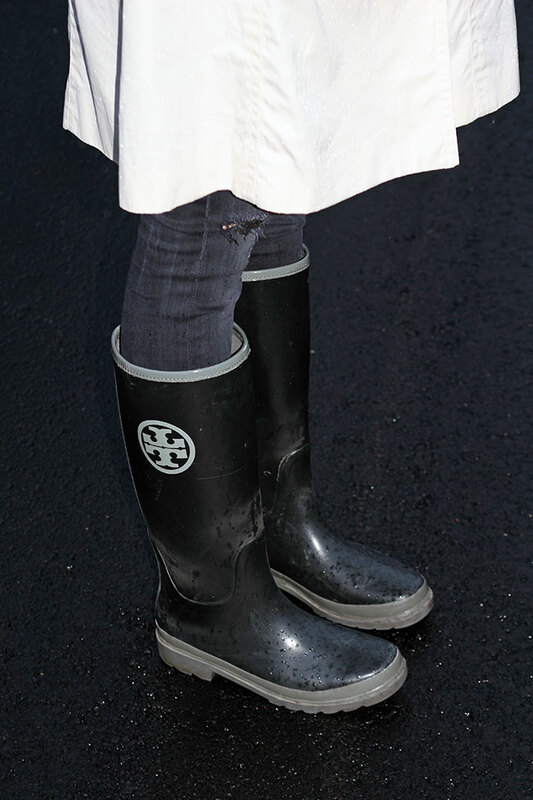 Rain Boots: The best way to keep your feet, and the bottom of your pants, dry is with a pair of rain boots. Today, there are so many options of stylish rain boots, and I love that most are extremely comfortable. They are another staple that can be worn year round, as you can add boot socks to make them warm enough for the snow. A Printed Umbrella: Lets face it, an umbrella can be a little annoying to have to carry around, but they do offer the best protection against the rain. I love using umbrellas with fun prints, as they make the perfect accessory to brighten up your outfit. A Hat: Not only do they protect your hair from the rain, adding some frizz control, but they also add an extra layer of warmth on those rainy, chilly days. There you have my four rainy day essentials. I've shopped around for some great options including the perfect trench, stylish rain boots, and fun umbrellas, which are all linked below. Wishing everyone a great week ahead, and thank you for stopping by. Rain boots and a printed umbrella are so key! Practical and fun. I love the this rainy day look. You make it look so fun to have it rain. I love the trench. The color is fantastic and I also love the umbrella. I always prefer a printed umbrella as well. It's funny how a print on your umbrella can really lift up your mood on a rainy day. You look perfect! You look fabulous even on a gloomy day! How cute are those boots and I am loving that amazing trench! I love the cute umbrella!! Looking fabulous with the coat, dear. Cute and rain-ready; loving that great trench! The weather is so strange lately! You have the essentials down though. I need some good rain boots! Can't get enough of your Tory boots! I LOVE those Tory Boots and your outfit is just darling!! Followed you on Instagram. Your blog is fabulous, right up my alle! Such a great rainy day look! A great trench coat is essential!! So cute, I love this. Those rain boots are adorable. Hope to see you at tomorrow's linkup! I think I need a trench coat like this - you're right, every girl should have one! I love that umbrella, too! You make rainy day styles look cute! Love the boots! A classic trench is always a must for rainy days! Take it from a Seattle gal! Oh Rachel, I agree with all your essentials. Earlier this January I had a rain day post, featuring similar items except since it was very cold I wore a down coat rather than a Trench coat and a beanie instead of a fedora. But I love trench coats and own several. I also love Fedora and Panama Hats. =) Your boots and trench are gorgeous. P.S. Meant to comment here when I first read this post but then forgot.